Pat Wilson and Arie Moffat representing Team Canada and Kingston Yacht Club at the ISAF Youth Worlds in Langkawi, Malaysia. KYC will be bringing in a new beer from Beau’s All Natural Brewing each Friday in February. This year Chef Neil will be preparing a delicious special to go with each beer. Make sure you come to your club to try these exciting beer and food pairings! We will soon be re-launching TGIF`s for 2016. If you or a group you are involved in at KYC want to host a TGIF, please contact James to set up a date and arrange other details. Pulled pork with coleslaw on a bun. Beef burger topped with brie and caramelized onion. Muskoka Winterweiss is a dark wheat beer. Winterweiss (Vice) was developed over a warm cabin fire, filling the void for a flavourful yet sessionable brew to enjoy during a long Winters night. This Dunkelweizen is deep brown with notes of clove and banana. Muskoka Winterweiss partners the yeast and wheat character of a Hefeweizen with the malty richness of a Munich Dunkel. The result, a brew to enjoy all Winter long. Seasonally brewed and available in limited quantity. Up next will be Beau`s Farm Table 80 Shilling Ale, a Scottish-style ale to be released just in time for Robbie Burns Day! | Way to go Pat & Arie! 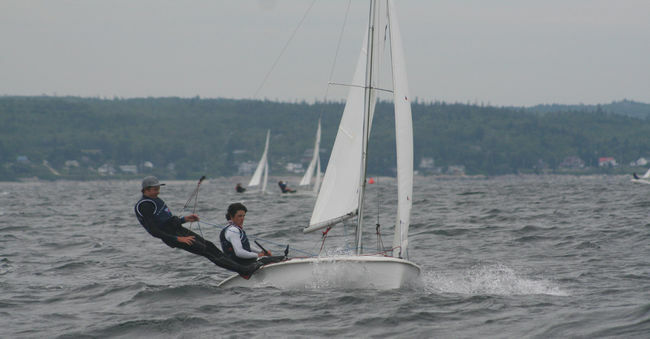 KYC's Pat Wilson & Arie Mofat finished 15th out of 33 contries as they representated Canada in the 420 class at the ISAF Youth Sailing World Championship's held in Langkway, Malaysi over the holidays. Way to go Pat and Arie!